In the past weeks, there have been two major political announcements in the Anglophone world. The first was the United Kingdom (UK) referendum vote on June 23 to leave the European Union (EU), referred to as “Brexit”. The second bit of news was the nomination of Donald Trump as the Republican candidate for President of the United in July. Both events attest to the changing politics of these two countries. In fact, their divisions. The UK and US are both facing immense changes to their demographics. While both have a history of being ruled by upper-class white men, things are changing. Female politicians and leaders are slowly eroding the barrier of political patriarchy. Minority groups are gaining larger representation as well. 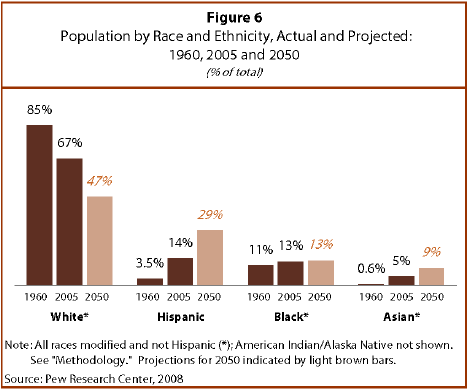 According to the US Census Bureau, “by 2044, more than half of all Americans are projected to belong to a minority group (any group other than non-Hispanic White alone); and by 2060, nearly one in five of the nation’s total population is projected to be foreign born.” By 2050, the Latino community will triple in size to 128 million and play a greater role in America, as shown by the Pew Research Center chart below. The era of white American hegemony is going to end soon and it’s unlikely to be greeted by acceptance by those in positions of power. Similarly, researchers find that the ethnic minority populations (including the Other White) would increase from 13 percent of the UK population in 2006 to 28 percent by 2031 and 44 percent by 2056. The UK is no longer a “country of emigration” either as, since the 1990s, the net inflow of foreign citizens remains about triple the net outflow on UK citizens. This demographic change may be altered by Brexit but will likely continue as the UK continues to be a popular destination for migrants. I will try to argue below that politics in the UK and US are pushing two powerful narratives. One is that the country is white and Christian, and needs to stay that way by pushing away migrants. The second is that this needs to be done through hatred and violence, which I believe only make the situation worse. These six ideas can be grouped together based on their audience. The first three ideas are about promoting neo-libertarian ideas: reduce taxes for the rich; slash government welfare; privatize health care. Although the Republican party is not alone in promoting a plutocracy (ruled by the 0.1%, literally as Trump is a member) in the US, following vile maxim of “All for ourselves and nothing for other people”, they are more fervent about it. Their reasoning is that welfare leads to a bloated government (which is a fair criticism) and thus hurts the middle and lower classes (a bit contradictory). This latter reason of helping American workers is a bit troubling since Trump, as well as Fiorina, lead businesses that profited from corporate globalization at the expense of American workers. So, it’s very hypocritical of them to now come out against free trade deals. The last three ideas focus on two imagined enemies: Hispanic and Muslims. A chorus of “Build that wall!” fills the auditorium at Trump rallies, spreading a hate-filled message to keep Latin American migrants out of the country, even if they do so through the proper legal channels. It is their “otherness” that this figurative wall is trying to keep out. During the Republican National Convention, a whole day was dedicated to the theme of “Making America safe again”. Leaving aside the fact that crime in America is declining, the rhetoric of security allows Trump to declare himself the “law and order” candidate. Trump has blanketed Latinx and Hispanics with the label of “criminal”. Trump recently stated that he wants to implement “extreme vetting” and possibly ban all Muslims from entering the country. The hypocrisy of these messages is that Republicans say they stand for religious liberty on one foot but kick Islamophobia with the other. Clearly, the idea is that Christianity is the only religion that will be tolerated. The difference in language of these two groups (Spanish and Arabic) is also used as means for their exclusion. Trump (and other American politicians) are pitting Americans against each other. One one side are the white American workers who have seen stagnant wages and high employment as a result of corporate globalization, something these same politicians promoted before and businessmen, like Trump, profited from. On the other side are people of color and anyone who isn’t a Christian. Supporters of Trump see people from Latin America as stealing “their” jobs. Even more divisive, Muslims are seen as stealing the American way of life. It isn’t said that both of these statements are false as businessmen like Trump exported many lower and middle class jobs over the last 30 years and that the country was founded on the merits of immigration. The UK has seen a similar trend in anti-immigration xenophobia, with the two groups being those from Western Europe and also Muslims. The collection of advertisements used by UKIP in the 2015 National Election use the language of ‘Take Our Country Back’ without providing any clear answers other than to be angry. Two months ago, the United Kingdom went to the polls to vote on Brexit – the British Exit from the EU. 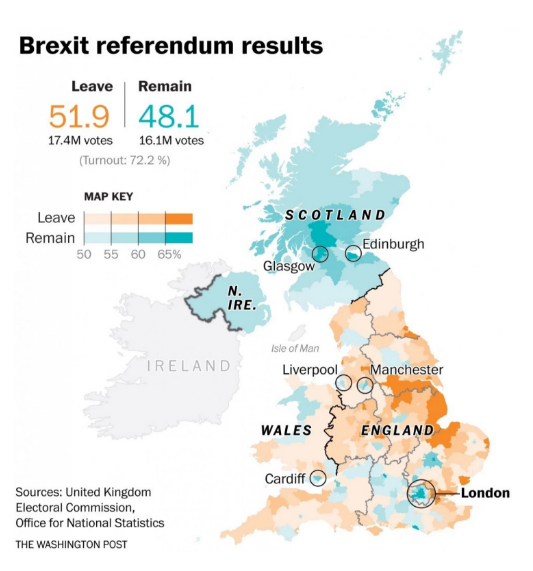 The Brexit vote highlighted very clear geographic divisions. On the Leave side is Wales and England, minus London. On the Remain side were Scotland, Northern Ireland and London. Large urban centers like Cardiff and Manchester also voted heavily to Remain. This clear division has one Washington Post writer predict a ‘Wangland’ of the future if Scotland and other territory were to gain independence. UKIP won 3.88 million (12.3%) votes in the National Election. David Cameron has called refugees and migrants “a swarm of people coming across the Mediterranean” as well as other dehumanizing language. These two countries, which speak English, mostly Christian and have red, white and blue flags, both see a rise of people shouting “Take Our Country Back”. Beyond Islamophobia in the UK, there are similar fears in Europe. As well as other longer ingrained anti-Semitism and anti-Roma sentiments. All of these fall under the banner of Western xenophobia. Taking something back implies that that thing (a country, even) is beyond your control, no longer yours. I n the build up to the Brexit vote, the UK was shocked by the assassination of British MP Jo Cox by a white nationalist is clear evidence of the extent that xenophobic rhetoric can have on people who feel disenfranchised and looking for a target. Immediately following the Brexit vote, a large increase in race- and religion-based violence was recorded. 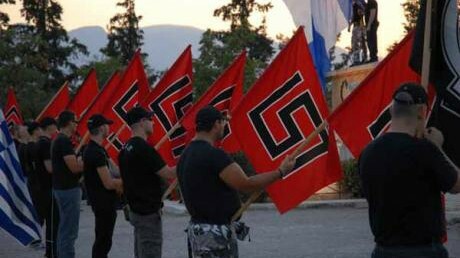 This is also seen across Europe as ultra-nationalism, neo-fascist and anti-immigration parties gain attraction. We, the people, must call out these toxic trends and work together to overcome the hatred and violence that far-right and neo-fascist groups are bringing to the West. There reemergence should shock us into action and not let us forget their damage caused in the early parts of the 20th century. We must promote compassion for and acceptance of human differences. We need to look forward and not repeat the mistakes of the past. We don’t need to take anything back. We need to make our countries home to anyone who needs sanctuary and to everyone who already live there, irregardless of how long that’s been.